Suggested Use: 1 capsule daily, or as directed by a health care professional. CDP-choline (Citicoline) is a form of the B-vitamin choline. It is used by the body to make cell membranes and also to make the neurotransmitter acetylcholine. CDP-choline began to be used in the 1960s as a treatment for brain injuries, and interest in it has grown with the realization that it offers a degree of protection against various kinds of damage to the nervous system (including the retina and optic nerve). The brain-bioavailability of CDP-choline is low, because the majority of the consumed dose is used outside of the brain. Fortunately the substance is not terribly expensive and so the low brain-bioavailability can be compensated for by using fairly large doses — 1000 mg/day, for example. The lack of toxicity of the supplement makes this possible without causing significant side effects. CDP-choline is a form of the B-vitamin choline. It is an intermediate in the synthesis of components of cell membranes and of the neurotransmitter acetylcholine. It also is a precursor of betaine, which is involved in gene regulation. 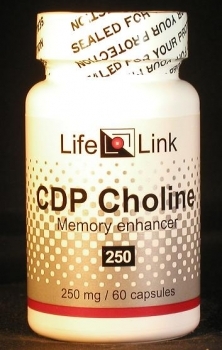 The biochemistry of CDP-choline has been studied since the 1950s and its clinical use began in the 1960s as a treatment for brain injuries.1 Progress has been very slow, perhaps because the potential applications of the substance were patented and were then subjected to financial and legal game-playing by the patent owner and licensees. Development was further plagued by clinical studies that sometimes reached conflicting results. Even now there is not yet a consensus on optimum dosages for various conditions. Nevertheless, interest in this supplement remains high; and there is general agreement that it offers a degree of protection against various kinds of damage to the nervous system (including the retina and optic nerve). The neuroprotective effects of CDP-choline may derive from its ability to increase the synthesis of phosphatidylcholines in injured nervous tissue.2 Phosphatidylcholines are major components of cell membranes. Accordingly, we will limit our discussion of CDP-choline to a brief summary of relevant research, and let you draw your own conclusions about what medical conditions it may be effective in treating. Two kinds of vision problems have been shown to be improved by CDP-choline supplementation. Both are problems stemming from damaged nerves. At long last, a major clinical trial has been organized to find out whether CDP-choline’s benefits in stroke and dementia can be translated into a treatment for traumatic brain injury. The trial, called COBRIT, started in 2007 but is still recruiting participants (as of April 2010); it is scheduled to be completed in December 2010.20 We eagerly await the results, which we anticipate will catapult CDP-choline into a first-line treatment for such injuries. The brain-bioavailability of CDP-choline is therefore low, since the majority of the consumed dose is used (or wasted) outside of the brain. Fortunately the substance is not prohibitively expensive and the low brain-bioavailability can be compensated for by using fairly large doses — 1000 mg/day, for example. The lack of toxicity of the supplement makes this possible without causing significant side effects. Are CDP-choline supplements useful for the conditions and purposes mentioned above? We aren’t allowed to tell you, so you should take a look at some of the references cited here, and then decide for yourself.